This is the first of our #Singles events. It’s not Tinder, Grindr or speed dating. Just a cool way to meet other like-minded singles while doing something fun. Like making food! Food Jams are social gatherings hosted by Masterchef SA Season 1’s Jade de Waal where friends and strangers come together to prepare a meal together, often resulting in new friendships being formed, and participants realizing they can actually cook. 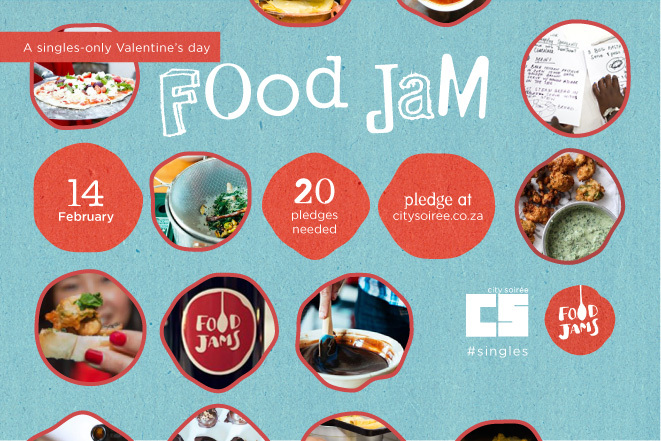 This specific Food Jam is our antidote to Valentine’s Day. Just because you are single doesn’t mean you should have to sit at home. Trust us, your “couple friends” are going to be seriously jealous! Ticket sales close at 12pm on day of event.